We received a 2012 calendar from a local business yesterday. It’s one of those with the calendar on the bottom and pictures of Chicago on the top. The calendar has helpful reminders like February 10th which shows “Monster Truck Jam, Allstate Arena, thru 2/12; Girls H.S. Bowling Tournament, Rockford, thru 2/11”. Be sure to note that on July 4th there’s an entry for “4th of July Parade, Arlington Heights.” I grew up in Arlington Heights and it’s got a great 4th of July Parade, but so do lots of communities around here, most notably, right next door in Evanston. A quick flip through it revealed a curious set of pictures; one that only occasionally shows the beauty of our city. 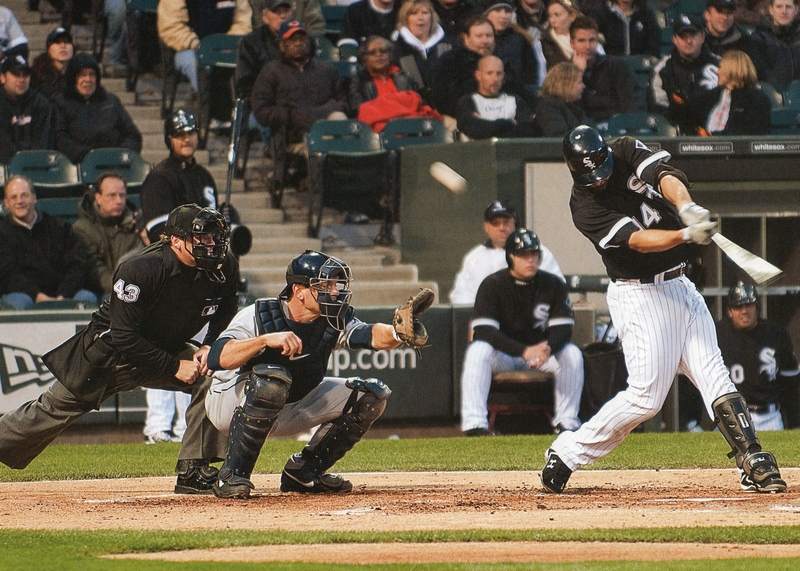 May: An unidentified White Sox player is fouling off a pitch (the ball is above and behind him as he swings); not hitting a home run or even getting a single. A foul ball; strike two! In the background are Sox fans huddled in parkas and ski hats, looking generally displeased. (It has occurred to me that you could take a picture at a Sox game on the most beautiful day imagined and it could be appropriately captioned “Sox fans looking generally displeased.”) Not only is the photo of something not-so-great happening, there are a grand total of zero happy people in the picture. He fouls it off for strike two. And let's immortalize this moment, shall we? July: Fireworks at the lakefront, although there’s nothing in the shot but smoke, explosions and a few boats in the foreground. A picture taken at a random Wisconsin lake would hardly look different. Hey, Mr. Photographer! Have you seen those giant buildings? They make a wonderful backdrop! November: November is my favorite. 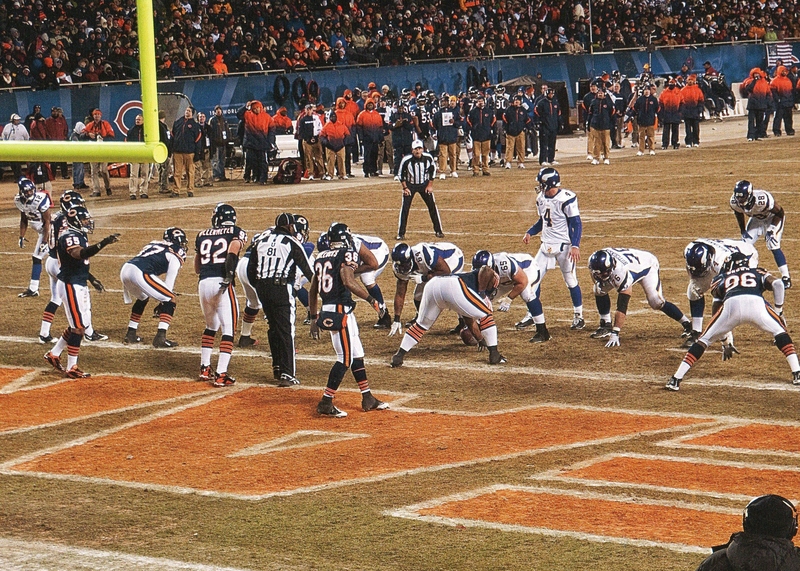 It’s a photo of a Bears game in Soldier Field. The Brett Favre-led Minnesota Vikings are lined up a the Bears’ 2-yard line and are about to score. The Bears in the shot are looking around at each other, pointing to one another like they’re not sure who is doing what on the upcoming play. Now there have been years in which that really is how most Bears games are played, but jeez. At least it’s not snowing! In a year in which the Bears lose in the NFC Championship Game to the eventual Super Bowl Champs, THIS is the best picture of a football game you've got?! December: Ice skating in a(nother) snowstorm! I’ve lived here most of my life and it’s a fact that it might snow in each of the months in which snow is shown falling or having fallen. I also understand that snow makes for interesting photographs, but looking at the calendar as a whole, you’d swear it snowed all the time and the calendar might be for a more picturesque version of Minot. That makes seven (7!) of the twelve months with inexplicably bad pictures in them! I’m sure that the nice people who own the business that sent the calendar merely bought it as a completed project and put their advertisement on it as opposed to personally having selected the pictures, so I assign no blame to them. They were just unwitting sponsors of this train wreck of a marketing piece. Is "Viking" the Scandanavian word for "hubris"? My favorite football commentator, Gregg Easterbrook (author and general smart guy) in his guise as ESPN.com’s Tuesday Morning Quarterback shows us not one but two lessons of Ancient Greece in his analysis of the Vikings / Saints game on Sunday. 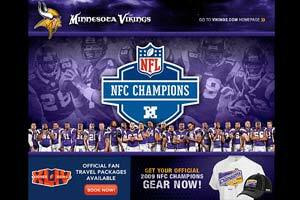 The first example is of hubris in the posting of the picture attached above on the Vikings’ website during the fourth quarter of the game. Aristotle and his boys would have loved that. Considered the greatest crime of the ancient Greek world, the hero performs some act out of great pride that leads to his/her death or downfall. Well done, Vikings front office! Hamartia. The “tragic flaw” described by Aristotle: A leader cannot control his own inner shortcoming, which causes him to achieve the reverse of what he desired. In “Antigone,” the king, Creon, tells himself he is acting in the interest of the city, when actually he is acting to glorify his own ego — this hamartia destroys him. Brett Favre comes up a bit short of a character in ancient Thebes, but on Sunday he was brought low by hamartia all the same. It was not enough for Favre’s team to reach the Super Bowl — he had to get the credit. Game tied with 19 seconds remaining, Favre scrambled at about the New Orleans 40-yard line, with open field ahead of him. All he needed to do was run a few yards, hook-slide, call timeout, and the Vikings’ strong-legged kicker, Ryan Longwell, had a solid chance to win the NFC championship. But the credit had to go to Favre; he had to throw a spectacular pass at the end, so television announcers would swoon. So he heave-hoed a dramatic across-the-field pass. It was intercepted, and the Saints won in overtime. Perhaps you are thinking, “It was just a dumb mistake, and the whole thing happened in a couple of seconds.” No. Two years of Favre’s life built up to that moment. For two years, Favre has insisted that entire NFL franchises, the Jets and the Vikings, become thralls to his celebrity. He has used his stature to demand, demand, demand — the crux of the demands are always attention and publicity for himself. Now he is brought low. In two of the past three seasons, Favre has lost in the NFC Championship Game. Each time, his team seemed poised to win at the end; each time, Favre’s final play was a disastrous interception. And each of those title losses eventually came in overtime — to punish Favre for his hamartia, twice the football gods allowed him to come so close, so close, then denied him. Favre has been brought so low, he is now being laughed at in Wisconsin, and he has only himself to blame. Aristotle would not be surprised by the ending of the Favre saga. If, of course, it was the ending. Hit the guy in the right flat that’s standing 5 yards from any other opponent and he steps out of bounds and you win. But no. And now it’s vacation time down on the bayou for ol’ Brett, and time for another round of “will he or won’t he”. Can’t wait for that. The regular seasons of these sports border on the unwatchable–especially the NBA. They play six months to eliminate only a few teams, then play like it really means something for three months. Not so the NFL. Those guys are grinding on every down. I’d like to claim this insight as my own, but it has been previously made by Gregg Easterbrook in his guise as ESPN.com’s Tuesday Morning Quarterback. I’ve been reading his columns for years (since he was on Slate.com eons ago), and it has changed for the better the way I watch football and my understanding of it. For a football fan, I cannot give a stronger recommendation.